It is clear that land can be overgrazed, but cattle can be used as a tool to improve the health and productivity of the land. We understand that the long term health of the land is greatly dependant on our ability to properly manage the environment. We utilize prescribed grazing practices endorsed by the Department of Agriculture’s Natural Resources Conservation Service and the University of Arizona. We have received recognition for our partnership with such groups and are always actively analyzing what works best—especially in the arid climate of the O X Ranch. You may find it interesting to see the following screen print of our custom-made cattle tracking software that includes a map showing our pastures. The ranch manager records any movements of cattle each day using this software by simply clicking and dragging from one pasture to another. 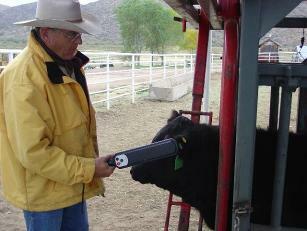 At any given time, it will show the number of animals in each pasture, field, or corral. This program also enables us to determine by a push of a button the total number of animal days in each pasture during any designated period of time. This assists us in evaluating the impact the animals are having on each pasture and helps us plan out future usage to maximize both the health of the animals and the health of the land.